I'm the husband of one, father of two, brother of three, co-host and producer of the Cavebabble Podcast, and have been an electronic musician for nearly twenty years. The Babblers return to the world of Star Trek television pilot episodes for The Vulcan Hello, where Star Trek: Discovery begins. Michael Burnham compels you to join us or suffer the wrath of her neck pinch. This episode is brought to you by Brand New Old Klingons. The following songs are used in this episode. All copyrights are to the artists listed. Cavebabble is back and ready to visit India for a look at Bollywood, from mythological epics to masked avengers. Join us! Also includes the song Metamorphosis from Eric’s new CD of the same title. This episode is brought to you by Dancing Super Heroes. It takes more than a Black Panther to rule Wakanda, and T’Challa is here to show the world how it’s done. Join us for a look at director Ryan Coogler’s smash hit. This episode is brought to you by Magnificent Meteor Minerals. 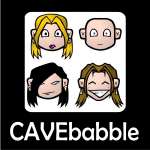 To Colorado and back again with Cavebabble. Hop in and join us for the second half of our road trip. Part Two is brought to you by Frogs In My Milk.